Nick & Priyanka are soon going to be married. Honestly, it still hasn’t sunk in. The speed at which they are moving towards their wedding date is a tad weird. We mean they are rushing. Guess when you know you know. But we have to agree they make a cute pair. Nick with that jawline and a sweet smile can make any girl go weak in the knee. As for PC, well, she is a perfect example of beauty with brains. Presently, the lady is in the US and is having fun in LA. 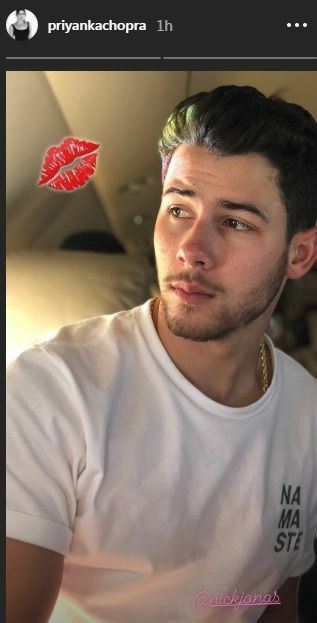 But she is also loving being with her beau so much so that she has posted a really good-looking pic of Nick on her Insta story with a KISS emoji. If that doesn’t make you want to be in love, nothing will. As per a Mumbai Mirror report, Priyanka and Nick are supposed to attend a wedding in Italy. A source told the daily, “Priyanka completed the first schedule of Shonali Bose’s The Sky is Pink with Farhan Akhtar and Zaira Wasim earlier last week and will now only join them again towards the end of September.